Federal agencies for the first time since 2015 are beginning to update their shutdown contingency plans, noting who would continue to work and who would get sent home in the event Congress fails to reach a budget deal. White House officials warned agencies they should begin preparing for a lapse in appropriations during a phone call led by the Office of Management in Budget. Lawmakers have until Friday to pass a measure to keep agencies open, and the call is routine any time a shutdown deadline nears. An update to OMB guidance during the Obama administration required agencies to update their shutdown plans at least every two years starting in 2015. Nearly all agencies refreshed their documents spelling out who would or would not be furloughed in September of that year, and only a handful have done so since that time. On Monday, 10 agencies submitted their updated shutdown guidance to OMB. Most were small agencies, such as the Chemical Safety and Hazard Investigation Board and the Commission on Fine Arts. Some larger agencies also released new plans, however. The Housing and Urban Development Department would furlough about 97 percent of its 7,800 employees during a shutdown. That is a slight uptick from the 96 percent of its workforce the department sent home in 2013 and planned to send home in 2015. Under the Anti-Deficiency Act, guidance from the Reagan administration’s Justice Department and subsequent instructions from OMB, agencies can keep employees on board during a shutdown for a few reasons. Those employees by and large must either be necessary to protect human life or property or receive a salary from sources other than annual appropriations. Employees working during a shutdown do not receive their normal paychecks but are guaranteed back pay. Furloughed employees are sent home without any promise of pay, but Congress has historically acted to pay federal workers for the time they were forced to miss. The General Services Administration would furlough just 3 percent of its 11,000 workers. 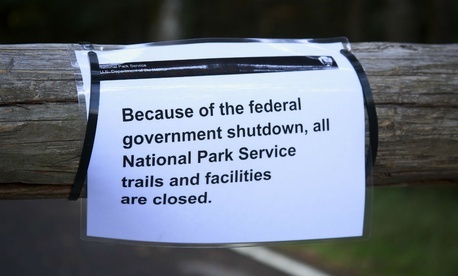 In 2015, the agency planned to send home 7 percent of its workforce, but during the 2013 shutdown it furloughed 76 percent. The dramatic shift occurred because GSA determined most of its employees were paid through non-appropriated funds. NASA also posted updated guidance; it would furlough about 95 percent of its 17,000 employees. As with all agencies, NASA noted its numbers were not set in stone. “Some of those personnel on duty would be authorized to recall others to respond to any contingencies or emergencies that occur during furloughs,” the agency wrote in its contingency plan. During the 2013 shutdown, the Defense Department recalled most of the 400,000 civilian workers it initially sent home due to a law Congress passed specific to the event. The Federal Emergency Management Agency brought some furloughed employees back to work in anticipation of a tropical storm. All told, the Obama administration planned to furlough about 860,000 federal employees in 2015, or about 40 percent of the workforce. An OMB spokesman would not comment on whether the Trump administration has pushed for the updated agency plans its guidance requires, saying only that it would post the plans as they come in. Republican leadership in Congress is currently looking to push back its funding deadline by two weeks with a stopgap measure. Democrats and some conservatives have yet to back the proposal, however, putting its passage in question.